Hey friends! I wish I could say I've made the most of my summer by going to the beach and being outside as often as possible, but the reality is that being 6 months pregnant makes being outside, despite GORGEOUS weather, a lot less fun than it was last year! But don't fear, I do have a nice base tan going so obviously I've been out SOME. I've also visited the local sno cone stand no less than 5 times and eaten a LOAD of ice cream, so I assure you all I'm living my best life! 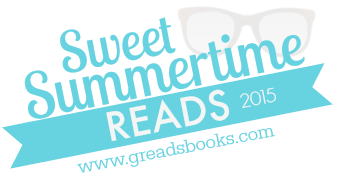 When Ginger invited me to be a part of Sweet Summertime Reads, I knew EXACTLY what I wanted to do! I've got a few standby classic summer reads that I always recommend and love to reread. I've also got a few on my summer to-read pile that are of the contemporary persuasion (those who know me will know that I am a SFF junkie so reading contemporary is definitely a seasonal thing for me). And as a bonus - I've got my favorite summer accessories to share with you! So let's get to the goodies, shall we? Oh you guys. These are the summer books that stuck to my ribs and I forever and always recommend to people looking for a summer or beach read! AMY & ROGER'S EPIC DETOUR by Morgan Matson is like the quintessential summer book. There's an epic road trip + the main character is finding herself + conquering fears + trying new food places + epic playlists + swoooooons = YES. WANDERLOVE by Kirsten Hubbard is about a girl who travels abroad by herself and navigates a foreign country while discovering who she is and what she wants out of life and my copy has at least 25 post it flags with meaningful quotes in it. 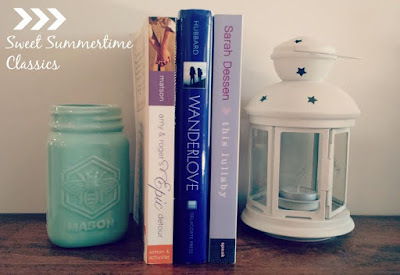 And finally, a summer reads list just wouldn't be complete without Sarah Dessen! THIS LULLABY was the first Sarah Dessen book I read and definitely holds a special place in my heart for that reason. Dessen writes with this casual sincerity that you can't help but devour. Alright, so some of these are kind of summery but mostly they are contemporary because as I stated before, I'm all about that sci-fi fantasy so reading contemporaries is already a stretch for me! First, THE DISTANCE BETWEEN US by Kaisie West! I've heard fabulous things about Kaisie West and I was thrilled to receive this book from my OTSP Secret Sister last year! It sounds like a sweet romance with some twists and turns for good measure which is perfect for a quick, summer read! Next, HELLO, GOODBYE AND EVERYTHING IN BETWEEN by Jennifer E. Smith because HELLO Smith is like the queen of "YA in a Day" and I absolutely adore her writing. 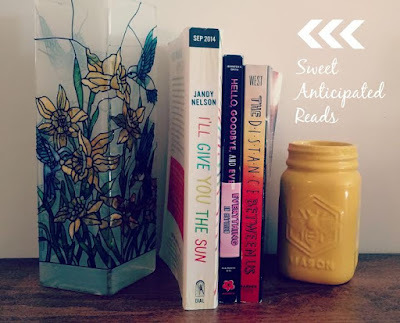 Finally, I'LL GIVE YOU THE SUN by Jandy Nelson. Sure, it has sun in the title which helps, but something about Nelson's writing combined with the heavily character driven plot just feels like summer to me. I have heard nothing but amazing things about this too, so it's about time I got on the bandwagon! 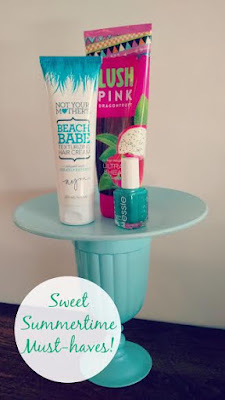 I tend to keep it pretty simple in the summer, but these are my go to products as of late! First, Not Your Mother's Beach Babe Texturizing Hair Cream is what I use pretty much daily. I get too hot blow drying my hair every day, so this is a way for me to have a little texture without the crunch and a very easy style! Second, Lush Pink Dragonfruit from Bath & Body Works smells DIVINE and I am already in fear of when I run out because what if they discontinue it?! Finally, Naughty Nautical by Essie because that blue is perfect for summer on the toes or the nails and Essie is my favorite nail polish brand of all time ever. 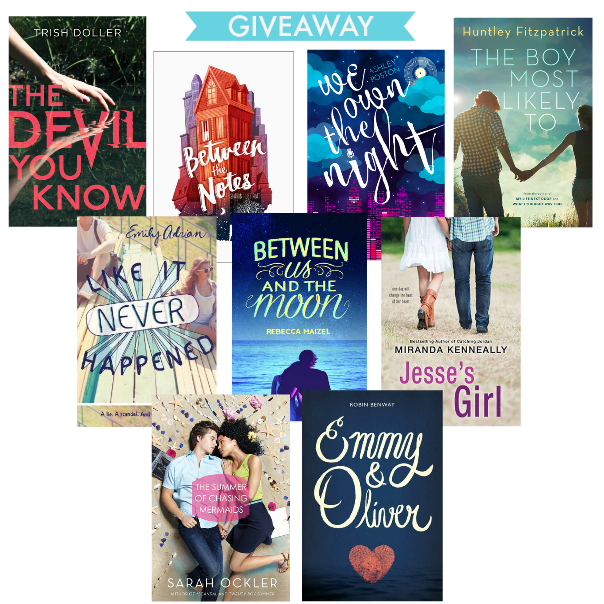 Thank you to Ginger for inviting me to be a part of this fabulous Sweet Summertime Reads feature! I hope y'all found a new book to read or a new product to try! Happy summer, friends! Oh Lisa, I ADORE this summer post! You've featured some of my favorites YAs plus recommended some awesome products that I am going to try out. I know you're not a huge contemp fan, so this warms my heart like no other to see all this contemporary goodness from you! And yes, Sarah Dessen is every bit summer. Thank you so much for sharing your sweet summertime reads with us! 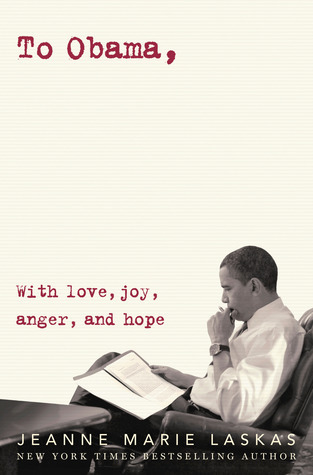 I am reading The Fifth Gospel - love long sunny days to read.